You want to buy access to one of our courses for somebody else? Let us walk through an example. 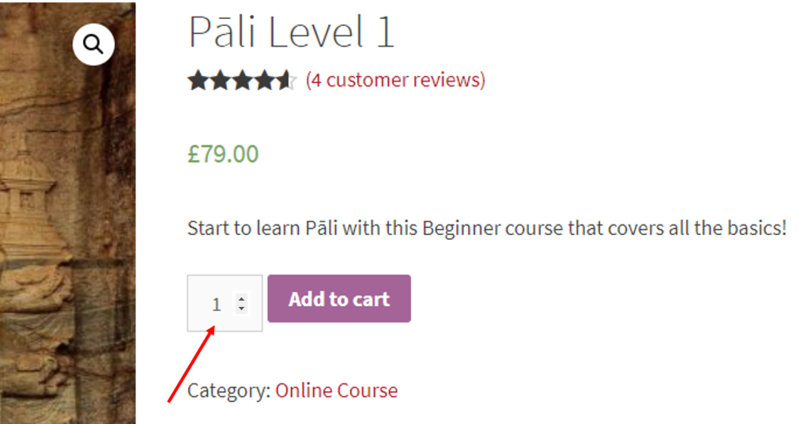 Say you want to buy access to the “Pāli Level 1” course for 3 friends. Left from the “Add to Cart” button, you see a small window with a number in it which will normally be a “1” (see image on the right). You can either click into the small field, mark the number and type in another one or you can use the arrows next to the number to choose the correct one. In this example, it will be a “3”. 5. Review your shopping cart and make sure the correct number is displayed under “Quantity“. If not, you can change it here in the same way as before. 6. Click “Proceed to Checkout”. We need to have the first name and surname of the person, as well as their email address. The exact way you write this does not matter, as long as it is clear which name goes with which email address. 8. When you’re done, click on “Proceed to PayPal” and complete your order there. Alternatively, if you don’t want to or can’t fill out the details of the course receivers at this point, you write “Course for somebody else” or something similar into the “Order notes” field. Later on, when you have the details, simply write an email containing the needed details of those who should get the access to admin@ocbs-courses.org. "What if I want to buy a course for only 1 person?" In this case, you just leave the “1” as the quantity of the course purchase. Everything else stays the same. You can either put in the details of the recipient into the “Order notes” box or send an email afterwards. Please note: Purchasing the course for others will not give you access to the course as well. If you want to buy access to the course for yourself and somebody else, buy 2 instances of the course. In the above step-by-step example, you would have to change the course quantity in the purchasing process to “4” if you wanted to have access to the course yourself and buy access for 3 friends.